Ever since Muhammad Ali’s stunning 1974 triumph in Zaire, a simplistic yet popular myth has persisted, that being the so-called “Rope-a-Dope” strategy. 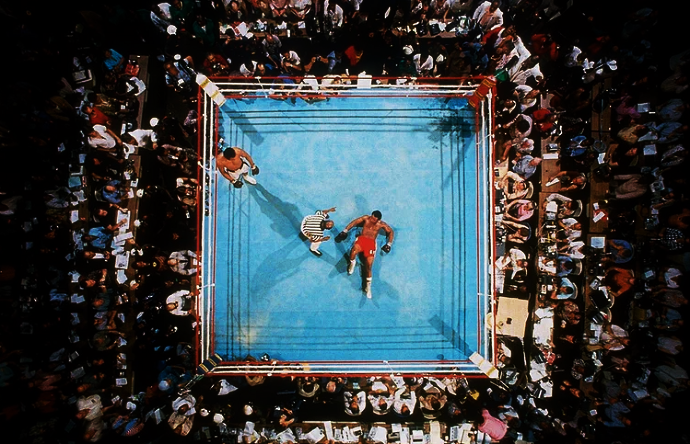 In the decades since that great upset victory, the idea that “The Greatest” achieved his unexpected win over George Foreman primarily by absorbing punishment and letting the champion punch himself out became widely accepted, to the point that Ali’s true achievement has become obscured and forgotten by many. Great analysis. This remains one of the most awe-inspiring performances in heavyweight history. I’ll leave Ali’s technical brilliance to you, but I will comment on the spirit he shows in this fight, which is extraordinary. After the first round, when Ali had returned to his corner after taking a drubbing from Foreman, there is a fantastic shot of him standing with his hands resting against the ropes, his face staring nervously across the ring. The moment is narrated perfectly by Norman Mailer in the documentary When We Were Kings, when Mailer recounts how it was the first time he had ever seen Ali scared. “The Greatest” was finally in the ring with someone who was younger, bigger, and stronger, who hit harder and fought more ferociously, and who was completely fearless. It was the sort of test Ali had never encountered. Rather than wilt, he regains his composure and uses his superior boxing intellect and sheer will to overcome Foreman’s barrage. Ali would simply not let himself lose. There is an interesting youtube interview with Mike Tyson where he is asked (probably for the ten thousandth time), whether he would have beaten Ali in his prime. Tyson shakes his head and says no, because “Ali’s ego supersedes everything.” He was just too mean, Tyson declares. This is a fascinating insight, which resonates more because it comes from Mike Tyson, who—unlike basically every one of us who writes about the sport—has been in comparable situations to Ali inside of the ring. Tyson understands that what separates them is not so much physical talent or even boxing ability, but Ali’s unmatched strength of personality, ego, and self-belief. These qualities got him through his most difficult fights, but also doomed him when, later in his career, he continued to fight despite obvious physical degeneration. Ali’s finest quality, his will, ultimately destroyed him, but in his greatest moments will is what made him the best. I think Ali won the first round. Actually while I agree with some of the observations, it is actually obvious from many of the shots that it was the ropes that allowed Ali to “pull back”. Fact is Ali generally pulled back in the wrong manner, as pulling straight back is frowned upon. If the ropes were properly adjusted Ali could not have pulled straight back and would have been caught cleanly by a number of George’s shots, and the fight would have been very different. Not to take away for Ali’s genius, but the ropes had a definite advantage for Ali, and he did take advantage of them. Also a number of the techniques used by Ali were actually outside the rule book, but he got way with them and knew he could. You’re correct, Lance. The loose ropes were definitely a factor, though to what degree is difficult to say. Some speculated that this was by design but Angelo Dundee always insisted this was not the case. I have my doubts. Between rounds there was an attempt by ringside officials to tighten the ropes and Dundee went ballistic. And before Ali-Frazier III, if you watch the video, you can actually see Lloyd Wells attempting to adjust the turnbuckle and, I assume, loosen the ropes. As you say, this doesn’t detract from Ali’s ring brilliance, but it definitely was a factor in how the fight unfolded. I think this is a myth as well, the looseness of the ropes. If you watch follow-up Ali fights, ropes in different rings show similar give. Ali’s brilliance or Foreman’s overconfidence? Had Frazier vs Foreman or Norton vs Foreman lasted longer, the Ali fight may have been very different. 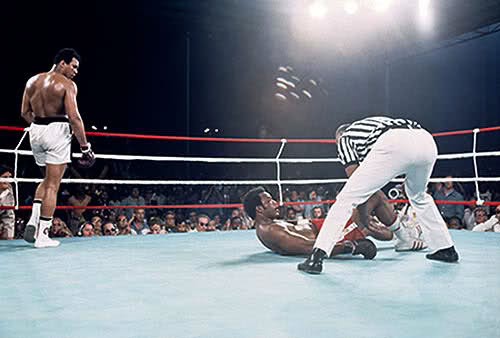 Foreman had not gone past four rounds in any fight in the three years prior to Zaire. Only three of his previous 40 pro matches had gotten to round eight. Foreman’s cardio, mindset and strategy would all have been affected by so many short fights. On the other hand, since Ali’s return from exile he had endured numerous battles that went 12 or more rounds, with Bonavena, Frazier, Norton, among others. In fact Ali’s only fight that went less than 6 rounds was the first with Quarry that was stopped because of cuts. Ali in the early to mid 70’s was in it for the long haul while Foreman was looking for the early KO. Once Ali made it past round five, George was in troubled waters and starting to sink. And don’t forget about the succubus!!! I think Ali’s mouth probably won him that fight. Foreman went from that efficient stalker in the Norton fight to a high output slugger, and it was clear that he didn’t have the stamina. All that talking from Ali just put Foreman on tilt.